On this Columbus Day, we celebrate Christopher Columbus—and by extension, Italy and Italian culture in the United States. It is fitting, then, to consider another Italian who, though perhaps less known, may have had more of an impact on American (and perhaps Western) culture—through architecture: Andrea Palladio. 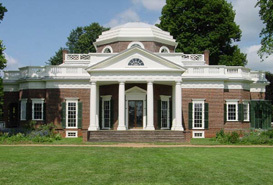 Thomas Jefferson, President James Madison, and many leading early American architects, among others, were heavily influenced by Palladio, as were great American architectural styles like Georgian, Colonial, and Federal. 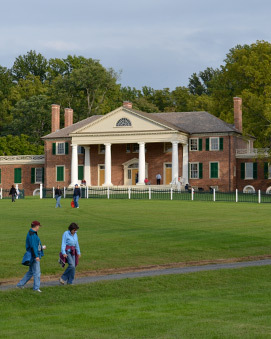 Some of the most prototypical of American buildings—such as Monticello—are steeped in Palladian principles. 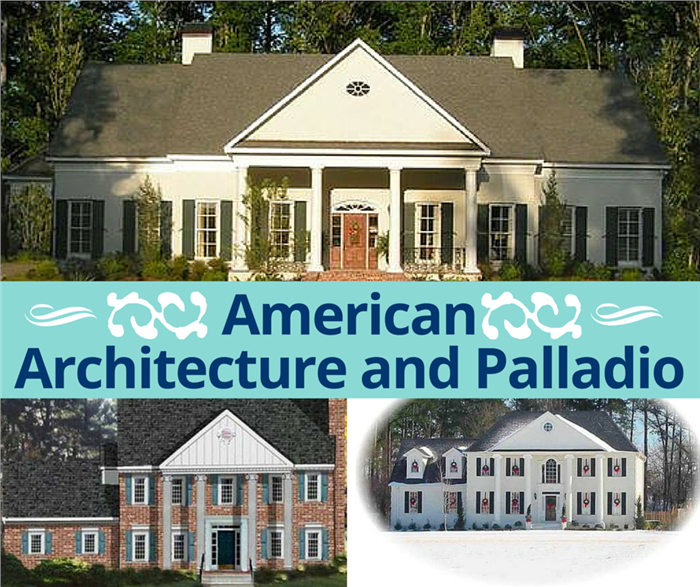 And a number of architectural elements that inform the American residential, commerical, and public landscape are a result of the influence Pallaido, among them pediments, porticoes, multipane windows arranged in an arc shape (the Palladian window), and landscaped courtyards. But it wasn’t just the American scene that Palladio influenced. He is often regarded as the most influencial architect in world history. Palladio was a most unlikely figure to influence world architecture. Born in Padua in 1508, the son of a miller and a stonemason by trade, Andrea di Pietro della Gondola was discovered almost too late in his life. After leaving Padua for Vicenza at the age of 16, he trained as a stonemason, joined a local guild and later became an assistant in the city’s top workshop. He specialized in decorative sculpture and the carving of monuments. The Italian Late Renaissance architect Palladio is regarded as the Western world’s most influential figure in the field. 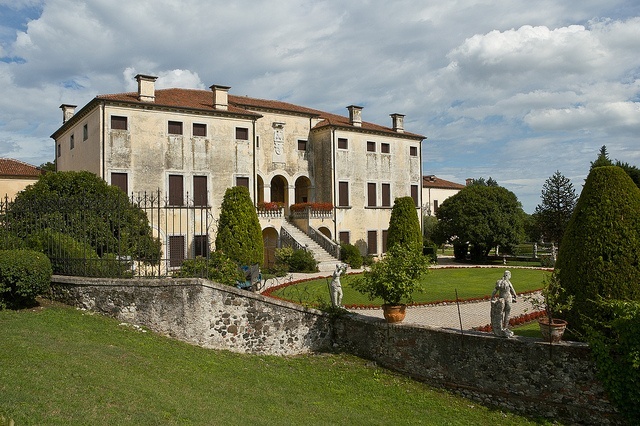 Villa Trissino in Cricoli, Italy (right) illustrates the concepts that anchor Palladianism: symmetry, order, balance, and harmony with the site. In 1538, at the age of 30, Palladio’s life changed dramatically. While working on the reconstruction of Villa Trissino, his craftsmanship caught the attention of Gian Giorgio Trissino, the diplomat, poet and scholar who owned the palatial estate. Trissino immediately assumed the role of mentor; and brought him to Rome where he sketched ruins and ancient buildings. Soon after, Andrea di Pietro della Gondola became Palladio after Pallas Athena, the Greek goddess of wisdom. Other historians note that the name was a reference to a fictional character in one of Trissino’s epic poems—the angel Palladio who saves Italy. Under Trissino’s tutelage, Palladio learned about principles of classic architecture and Renaissance art; as well as the ideas and work of the great architects of that time. Even before Palladio met Trissino, he was working on some major projects, including Villa Godi in Lugo di Vicenza in Northern Italy. It was commissioned by Gerolamo Godi in 1537 for his son Antonio. Without a doubt, Trissino’s patronage also aided in getting commissions for Palladio and his workshop. By late 1538 and beyond, Palladio was designing villas for the landed gentry in Vicenza and eventually, the nobility in Venice. 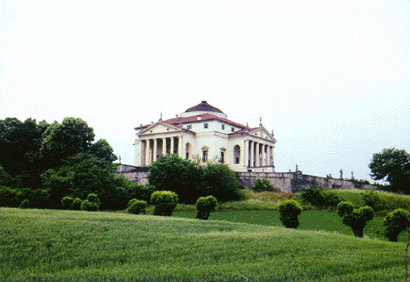 Villa Godi in Lugo di Vicenza is the first villa created by Palladio. It was commissioned in 1537 and completed in 1542. Palladio’s designs included palaces, churches (S. Giorgio Maggiore, Il Redentore, and “La Zitelle”—S.M. della Presentazione), and villas. But his reputation is primarily based on the villas—the elaborate country homes—he created in Vicenza. These villas were significant in European architecture of the 17th and 18th centuries, colonial America and our contemporary world. More than 30 villas—perhaps more—are attributed to Palladio. Whether the homes were for the Venetian nobility or the wealthy merchants of Vicenza, they all embodied the tenets of Palladianism: grace, harmony with the setting, understated decorative elements, and use of classical forms. 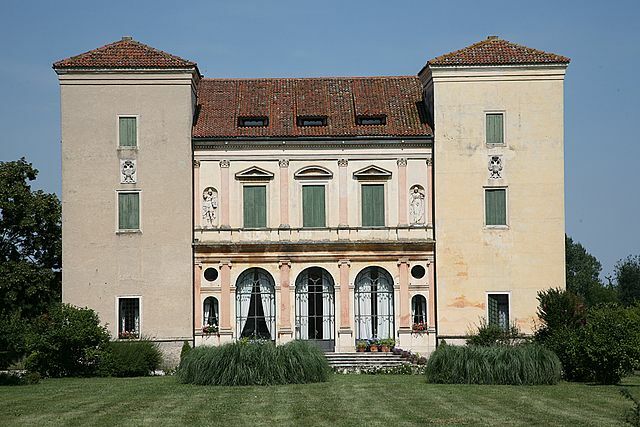 Villa Barbaro (Veneto)—designed and built for Daniele Barbaro, Patriarch of Aquileia and ambassador to Queen Elizabeth I of England, and his brother Marcantonio an ambassador to King Charles IX of France. 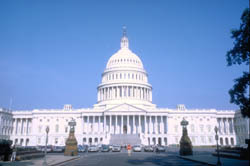 The design of Villa Barbaro (left) is the inspiration for many public buildings in the U.S., including the U.S. Capitol (right). With Villa Cornaro, Palladio employed the two-tiered portico, which to this today exists in Georgian and Colonial style house plans. 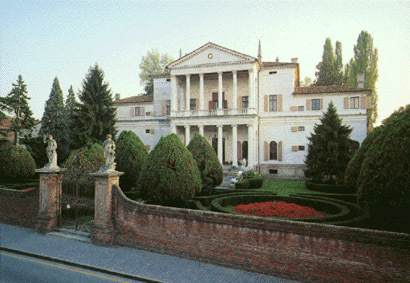 Villa Almerico or La Rotonda (Vicenza)—commissioned in 1566 by the Papal Prelate Paolo Almerico. La Rotonda or Villa Almerico is situated atop a hill and features a central dome, another Palladian design that is widely imitated in contemporary architecture. As Palladio continued to design and build villas, palaces and churches in Northern Italy, he added to his fame by being the first architect to publish a book that defined his concepts. Quattro Libri dell Architettura (The Four Books of Architecture) had a profound effect on building design throughout Europe and America. England was the first European country—outside of Italy—to embrace Palladian design, mainly through the efforts of Inigo Jones, the first English Renaissance architect who had traveled extensively to Italy; and studied Palladio’ buildings and drawings. Impressed by the Italian architect’s designs, Jones returned to England armed with several of Palladio’s drawing and his books. In 1615, Jones was named Surveyor-General under King James I: his responsibility was to plan and build royal architectural projects throughout the country. His first building was for Queen Anne—the Queen’s House in Greenwich. Work on the house was stopped when she died in 1619. Jones resumed work on the house during the reign of Charles I and completed the building for Queen Henrietta Maria in 1635. Queen’s House—which survived time and disasters—is the first building in England designed according to the concepts of Palladio. When Palladianism declined in 17th century England, Jones’s “followers”—among them Lord Burlington and William Kent—revived it during their time. Jones designed other buildings including St. Paul’s Church in Covent Garden and St. Paul’s Cathedral. But aside from Queen’s House, his only royal buildings that still exist today are the Banqueting House (Whitehall) and the Queen’s Chapel at St. James Palace. 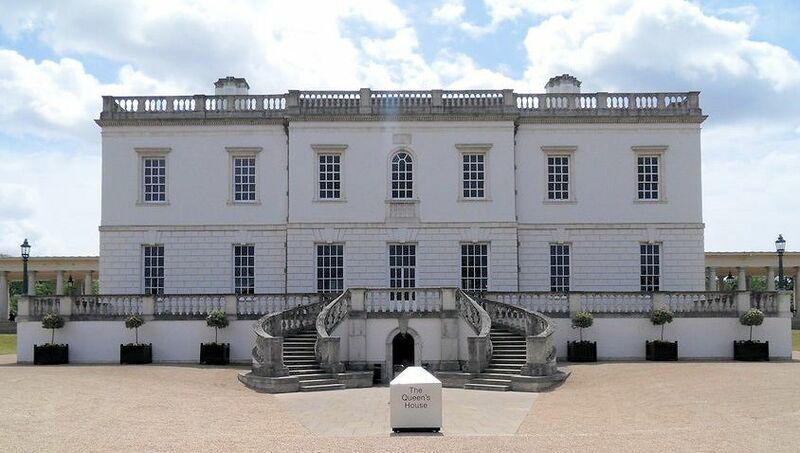 Originally designed for Anne of Denmark, King James I’s consort, Queen’s House in Greenwich was completed in 1635 for another king—Charles I and his queen, Henrietta Maria. Queen’s house highlights the proportion and symmetry basic to Palladian design. After studying Palladio’s drawings that showed how classic elements were applied to contemporary designs, early American architects began incorporating features of his villas into public buildings and private homes. Redwood Library in Newport, R.I.—the country’s oldest lending library—was designed by Peter Harrison and constructed in 1750. The first public building patterned after Palladio’s ideas, it showcases one of the earliest classical porticos. 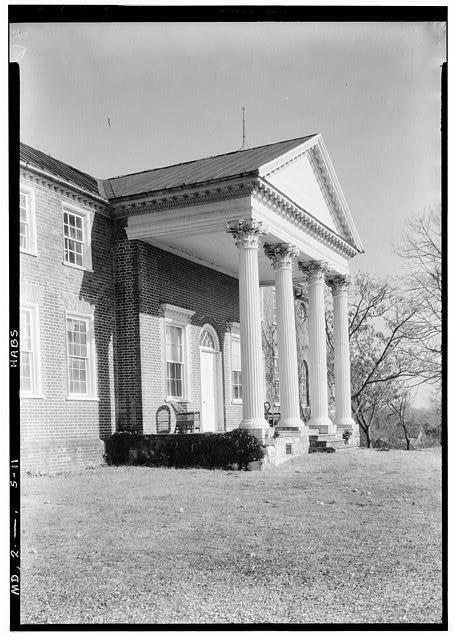 Whitehall Manor in Annapolis, MD was the earliest private home that featured a classic portico. 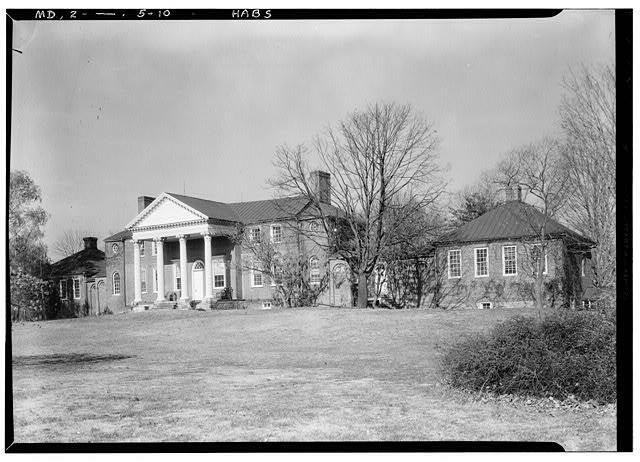 It was built around 1760 by the Provincial Governor Horatio Sharpe of Maryland. The style and classic art forms of Palladio have spanned generations and continue to be part of the American architectural panorama. Thomas Jefferson was the leading proponent of the Palladian style and incorporated its elements in almost all of his major projects—from Monticello to Poplar Forest, the University of Virginia, and the Virginia State Capitol. His design for the University of Virginia was a U-shaped, landscaped lawn with the library housed at its center inside a buildng called the Rotunda. 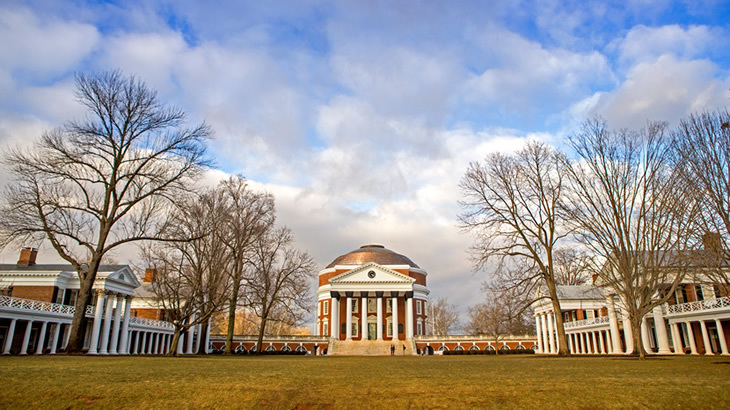 The Rotunda of the University of Virignia was designed by Thomas Jefferson as a small version of a Roman temple. 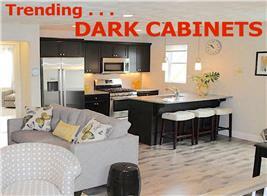 Displayed prominently are components that are heavily Palladian: pediments, porticos, colonnaded facades. For the Virginia State Capitol, Jefferson’s inspiration was the Maison Carree, a classic Roman temple located in France. Completed in 1788, it became the nation’s first public building to be constructed in the form of a temple—and subsequently set a trend for using classic forms in public buildings. 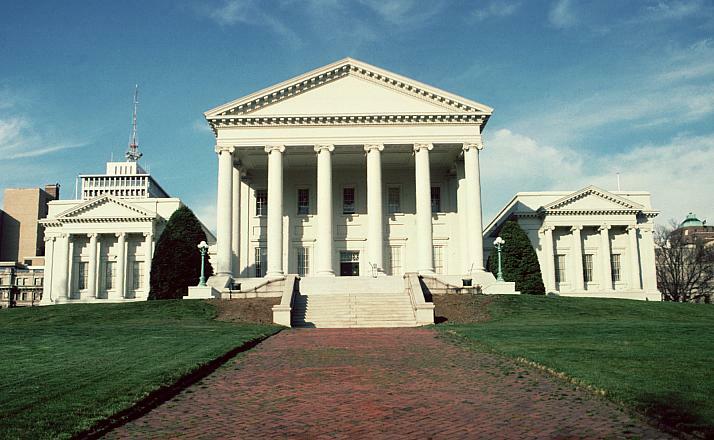 The temple-inspired Virginia State Capitol is another tribute to Palladian design principles. 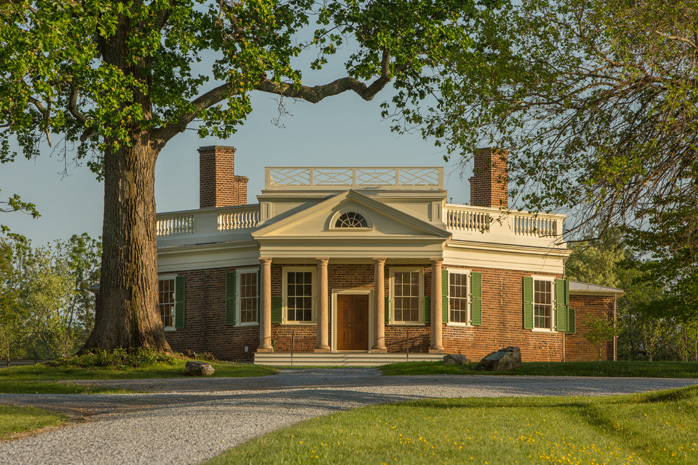 Jefferson’s enchantment with Palladio extended to his mansions—Monticello and Poplar Forest. These homes also featured porticos and domes that blended well with the overall symmetry and balance of Palladian design. Thomas Jefferson’s mansion at Monticello (left) and his retreat Poplar Forest (right) highlight Palladio’s concepts of art, proportion, and harmony with the setting. In addition to Jefferson, President James Madison was also influenced by Palladio. 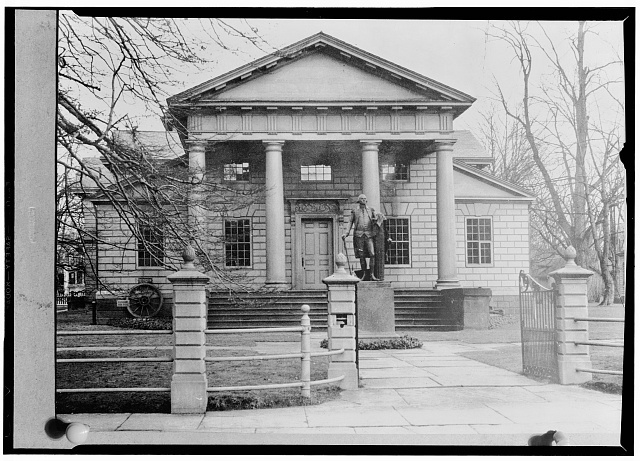 In 1790, Madison began an expansion of his ancestral home and added a portico to its exterior facade. Montpelier (Orange, VA)—home of President James Madison—includes a portico inspired by Palladio’s villas. 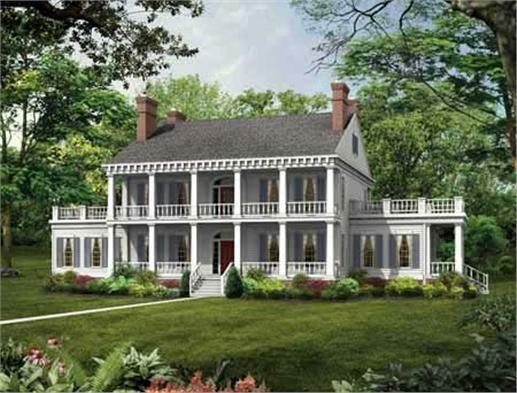 A two-story, four-bedroom Georgian style house plan showcases Palladian elements: the colonnaded portico, multipane windows that frame the front entrance, and the pediment above the front door (Plan # 105-1054). As Palladio’s designs moved into the modern world, some of his important motifs have been modified to fit contemporary lifestyles. A status symbol in Palladio’s era as well as in Colonial America, the portico indicated the importance and place in society of a family. In today’s world, the portico enhances the appearance of a home and adds to its charm and curb appeal. 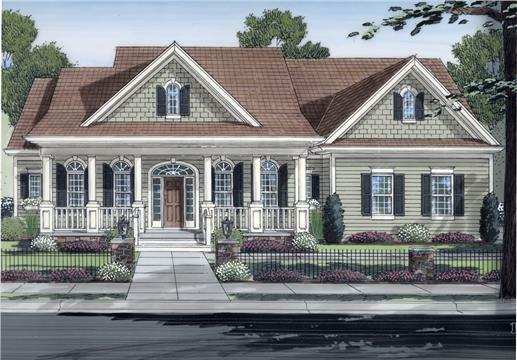 A rendering of this one-story, three-bedroom Georgian style country home highlights symmetry, grace, and balance. 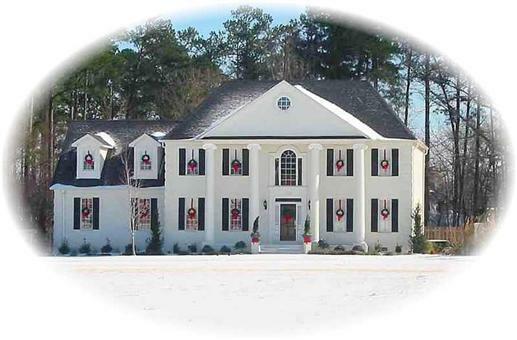 Check out its colonnaded portico and matching number of windows flanking the front door (Plan # 169-1047). Another popular feature introduced by Palladio is the two-tiered portico, which is most prevalent in the southern states of the U.S. 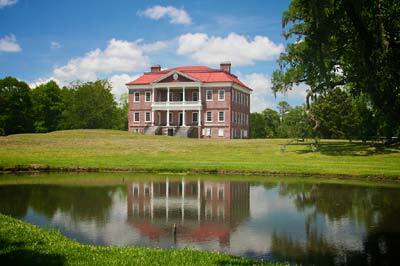 Early plantation owners constructed their palatial homes with a two-tiered portico. 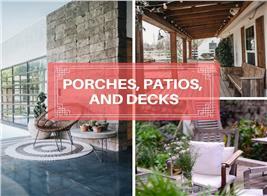 To this day, most homes throughout the South have two-tiered porticos where family and guests sit and enjoy the breeze and the natural landscape. One of the signature features of Drayton Hall (left)—a Georgian plantation home built in 1742 in Charleston, SC—is its two-tiered portico. 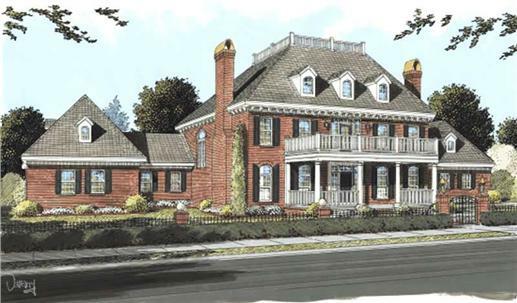 On the right is a rendering of a two-story Colonial home with a modified two-tiered portico (Plan # 176-1160). 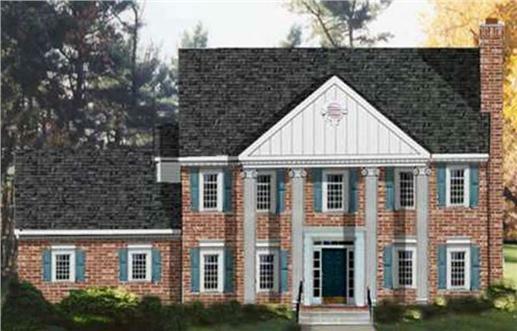 A rendering of a two-story, three-bedroom plantation style house plan shows the typical two-tiered portico popularized by Palladio (Plan # 137-1375). During the renovations to the Mount Vernon mansion, President George Washington added a Palladian window that illuminates the dining room. This is a large window with an arched center flanked by two narrow sections. These windows are often found in Federal style house plans. Similar to the two-tiered and colonnaded porticos, the Palladian window has been modified and is still found in contemporary homes. 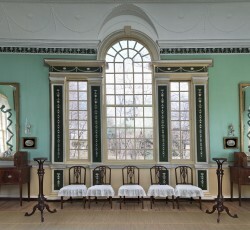 The Palladian window in the dining room of the Mount Vernon mansion (left) is one of estate’s attractions. On the right is a modified Palladian window in the master bath of a two-story, four-bedroom home (Plan # 101-1126). Check out the Palladian window on the second floor of this elegant two-story, four-bedroom Colonial style house plan (Plan # 170-2549). 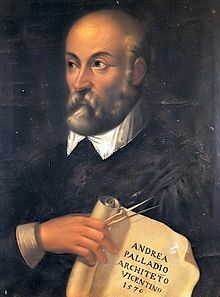 So as we celebrate Columbus Day and honor the man who discovered America, we also tip our hats to Andrea Palladio, the Renaissance architect who “shook the world” with his innovative ideas and designs.